The first non-Italian pope since Adrian VI in 1522, Karol Jozef Wojtyla, John Paul II became one of the most beloved statesmen of the 20th century. Little did he know that a Turkish thug was intent on assassinating him. In August 1980 Mehmet Ali Agca left Sofia in Bulgaria and began travelling across the Mediterranean region using a variety of aliases and forged travel documents. He left Milan and arrived in Rome by train on 10 May 1981. In the Italian capital, Agca met three accomplices: a fellow Turk and two Bulgarians. The operation was commanded by Zilo Vassilev, the Bulgarian military attaché in Italy. On 13 May 1981 Agca and a back-up gunman, Oral Celik, sat in St Peter’s Square writing postcards and waiting for the Holy Father to arrive. They planned to shoot Papa Wojtyla and then set off a small bomb and, in the ensuing confusion, escape to the Bulgarian embassy. The Pope appeared in a white open-top jeep, among a crowd of 20,000 pilgrims. 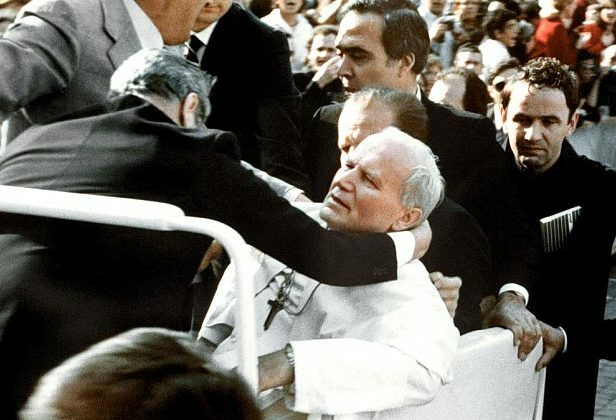 As John Paul passed, Agca fired several shots before the crowd grabbed him. Four bullets hit the Pope, two of them lodging in his lower intestine, the others hitting his left hand and right arm. Two bystanders were also hit. Celik panicked and fled without setting off his bomb or opening fire. The Holy Father was taken to the Agostino Gemelli University Polyclinic, where he underwent emergency surgery and blood transfusion. In June 2000, at the Pope’s request, Agca was pardoned bypresident Carlo Azeglio Ciampi and extradited to Turkey. Five years later, in early February 2005, during the Pope’s final illness, Agca sent a letter wishing him well.